Our restaurant is family owned and managed. We have over 20 years experience in operating restaurants and we are proud to serve a taste of our Cypriot heritage in Laguna Niguel. Cyprus is a beautiful Mediterranean Island near Turkey, Israel, Lebanon and Greece. The warm waters of the Mediterranean, perfect sandy beaches, historic castles, Roman ruins, scenic mountain views and wonderful food make Cyprus one of the most popular vacation destinations in Europe. According to popular legend, the goddess of love and beauty, Aphrodite, rose from the sea there which is why Cyprus is sometimes called the Island of Venus. 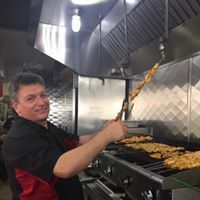 Our mission is to serve you authentic Cypriot-style Mediterranean food that is flavorsome and unique. We prepare our food to our family recipes with high quality natural ingredients and we do not add preservatives. To ensure quality and freshness, all food is made fresh to order and we source our ingredients from local vendors that we know and trust. We value our customers and we will strive to provide high quality customer service at all times to ensure customer satisfaction.